Hello and welcome to the 223rd instalment of the SWD. The Syrian Democratic Forces confirmed they took control of the railway station and its nearby streets on Monday 25th September. Unconfirmed reports based on ISIS statement created lots of confusion regarding a possible ISIS hoax. This fake offensive stated that IS entered Mashleb and Sinaa districts and killed hundreds of SDF militants. Although this information is highly controversial, late reports by some YPG international volunteers reported that a large number of IS terrorist infiltrated behind SDF lines dressed up as SDF fighters and “they get pretty far” as they entered from outside Raqqa. This is the YPG volunteer’s video. Widespread air bombings took place in opposition-held Aleppo and Idlib governorates from Russian and government warplanes. The targeted areas in Aleppo include Kafr Naha, Urem Al-Kurba, Al-Hajib, Tall ad Daman, Huwayyir, Kafar Halab, Atarib, and more villages located in west Aleppo countryside. Multiple civilians have died as a result and infrastructure damage is considerable. Russian and government air forces bombed also Idlib. The targeted villages include Saraqib, Benin, Jabal al-Zaiyeh, Kafranbel, Al-Naqeer, Muhanbal, and other areas with the same consequences as in Aleppo. Several civilians were dead and important infrastructure damage. Opposition forces targeted with artillery government areas as a response to the big Russian and Syrian government airstrikes campaign. 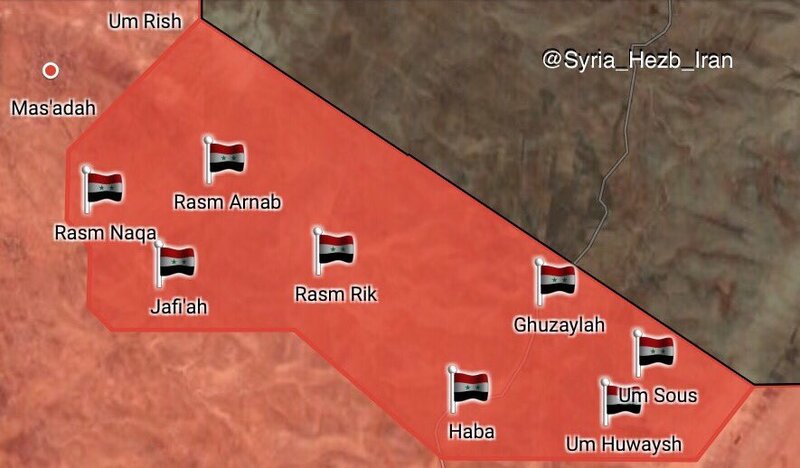 They hit Suqaylabiyah and Salhab towns. Allegedly, they also hit a Russian helicopter with a TOW ATGM in Khattab, but no Russian MoD confirmation has been emitted. 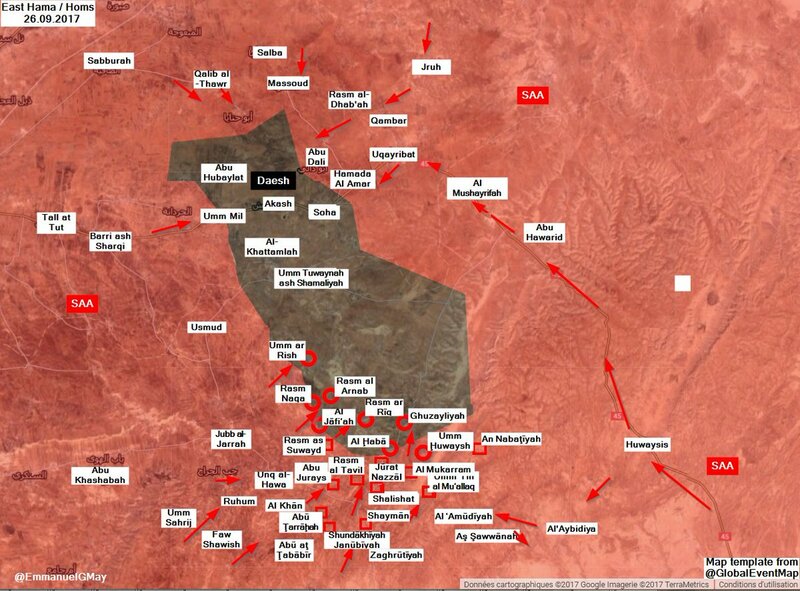 The SAA captured Umm ar Rish, Rasm al Arnab, Al Jafiah, Al-Haba and four more villages from the Islamic State forces. The total captured area is approximately 45 square kilometres. Government forces continued artillery and airstrikes in the same areas as yesterday. Civil casualties and infrastructure destruction are the main results of these bombings which targeted Ayn Tarma, Jobar and Douma. Opposition forces claim to have destroyed one tank in Jobar and to have killed 11 SAA soldiers and damaging a T-72 tank in Al-Rayhan in the eastern frontlines of eastern Ghouta. The Islamic State forces are showing strong resistance against SDF and SAA forces in the industrial districts of Deir ez-Zor city. Several SAA soldiers have been killed, as well as some US-backed forces militants. Russian airstrikes on SDF positions east of Deir ez-Zor have continued and some SDF soldiers were killed and injured. Government forces are also targeting the Kurdish forces. 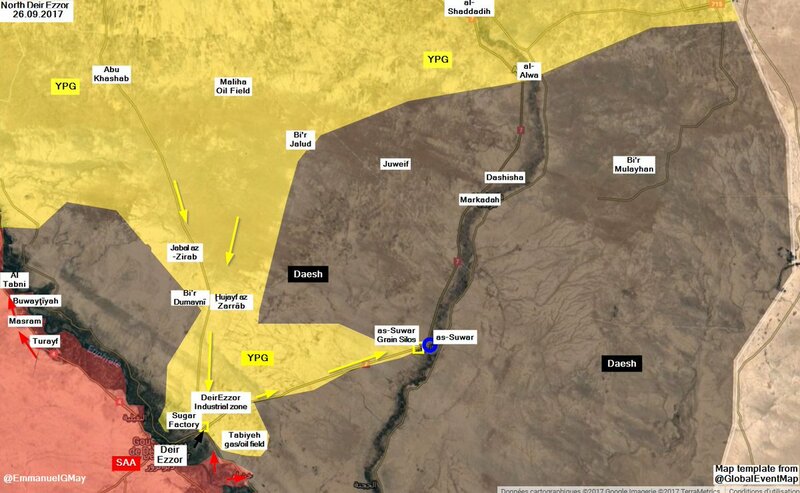 Although, on the eastern fronts against ISIS, the SDF took control of As Suwar and initial reports suggested that SDF already crossed Khabur river. 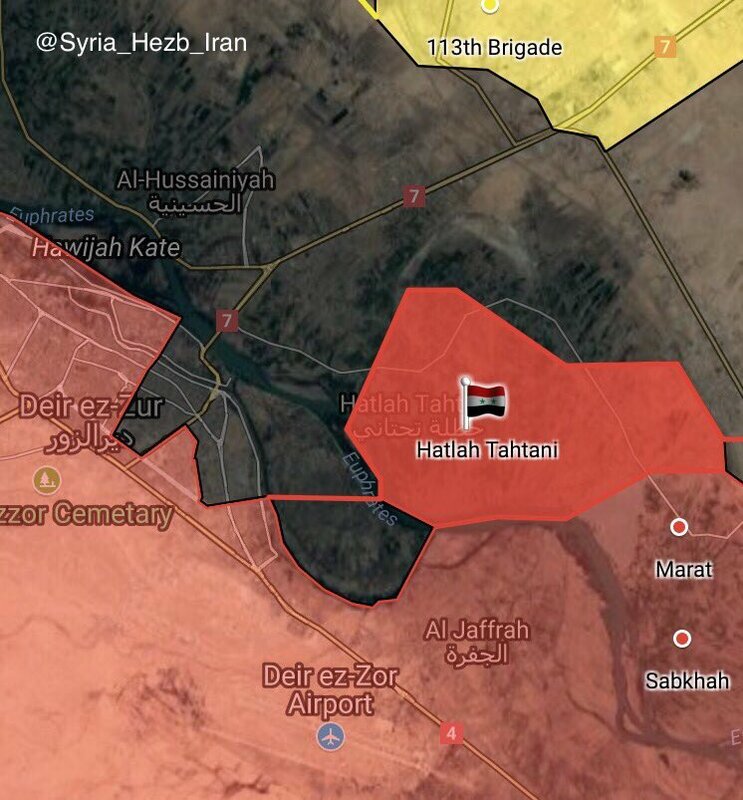 The Syrian Arab Army and allies have captured Hatlah Tahtani village, an area around 14 square km, situated on the east bank of Euphrates river. On the 25th of September 2017, CJTF-OIR has conducted 30 strikes in Syria. CJTF-OIR‘s main focus in Syria is Raqqa region where they did 26 strikes supporting SDF‘s operations against IS destroying 17 fighting positions, two ISIS headquarters and two vehicles. Other areas where four strikes occurred are Abu Kamal, Al Shadaddi and Deir ez-Zor destroying two ISIS staging areas, an ISIS headquarters, and a vehicle. The full report on CJTF-OIR strikes conducted in both Syria & Iraq can be found here.